1939 born, Austrian citizen, Gymnasium of Benedictine monastery St. Paul in Carinthia, Commercial High School in Klagenfurt, University of Vienna (Law), Magister iuris. Professional life: For 35 year career in Austrian international trading groups including overseas ship transportations; Chief Executive Officer; lifelong worldwide travels. Hobbies and interests: Lifelong Yacht-sailing, mainly in the Mediterranean, since 1978 Knight (Grand Cross) of Grace and Devotion of the Sovereign Military Order of Malta – SMOM; social work. 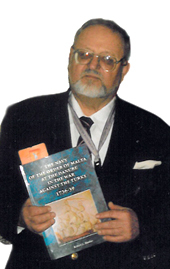 Already since his youth interested in history, mainly in the naval history of the Mediterranean and of Malta; the author started after his professional retirement a very lively career in historical and naval research; exhibitions and publications in German, English and Italian, mainly in the field of the history and naval history of SMOM as well as the old relations of Malta with Middle European countries. Die Mariene des Johanniter-Malteser Ritter Ordens, 500 Jahre Seekrieg zur Verteidigung Europas, 1. Ed. Weishaupt Verlag, Graz; 3. Ed. La Marina del Sovrano Militare Ordine di Malta, The Navy of the Sovereign Military Order of Malta (Colombiade Genova), Brescia 1992. Der Johanniter Malteser Orden in Österreiich und Mitteleuropa, 850 Jahre gemeinsamer Geschichte, Ed. Dauber. Band I Hochmittelalter (12 Jhdt. Bis 1291), Wien 1996. Band II, Spämittelater und früNeuzeit 1291 bis 1618), 1998. Band III, Neue Zeit (1618 bis 1798), 2000. Ordenspfarre und Kommende des Johanniter Malteser Ordens in Ebenfurth 1268 -1748; in Philapitsch, Ebenfurth. Pfarre im Wandel der Mächte Ebenfurth, 1997. Knights of the Sovereign and Military, Religious and Hospitaller Order of St. John of Jerusalem of Rhodes and of Malta in the National Navies of Europe 1300-1600, Naples 1997. Die Malteser Ordens-Marine im Tükenkrieg 1736-39 an der Danau, Wien. 2002 (English Edition in preparation). Bailiff Fra Joaquin de Portocarrero (1681-1760), Knight and Ambassador of Malta, General and Lieutenant-Fieldmarshal, Austrian Viceroy of Sicily; Priest, Patriarch, Cardinal, Bishop, Ambassador of Spain at the Holy See, Co-founder of the Library of Malta, Malta, 2003. Strategic and personal cooperation between the Knights of Malta and the Emperor in his wars against the Ottomans (1523-1798), in Journal of the Sacra Militia Foundation, Issue 3, May 2004, Malta. A rediscovery of the first contemporary and authentic picture of the Great Carrack SANT’ ANNA of the Order of Malta (1535), in Sacra Militia Journal, Issue 4, 2005. Federal Cross of Service of the Republic of Germany, etc.